Over the past few weeks, I’m sure you have noticed that we’ve been posting Lunchbox Tips on our Facebook Page! 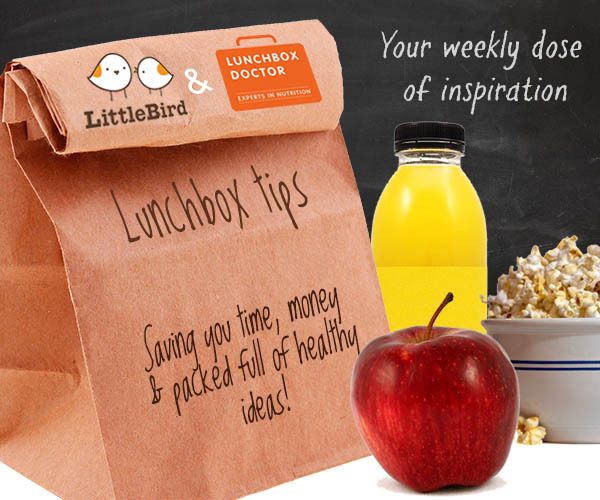 We teamed up with Jenny Tschiesche, founder of Lunchbox Doctor to give you a weekly dose of inspiration, bringing you some fantastic ideas that will save you some pennies and bring some healthy ideas to your little one’s lunches! If you missed out on the tips over the past few weeks, we’ve put them all here in a nice neat blog post, so you can take them with you all in one go! For lunchboxes pitta pockets, wraps and bread can easily be bought at reduced prices and frozen. You can easily split these into individual portion sizes before freezing. Some dairy products such as yogurt and butter can also be frozen and used when needed. Fruits such as berries can be frozen and used straight from the freezer, perhaps added to a yogurt or in baking muffins, cakes and flapjacks. Go to the reduced section on any shopping trip. Look for anything fresh that can be frozen such as fish or meat. Pick up reduced fruit and vegetables that could be used in baking. Overripe bananas are perfect for banana bread for example, whilst slightly limp carrots will work in vegetable muffins or carrot cake. Left-overs make great lunchbox foods: Cooked new potatoes, rice, or pasta can be a great basis for a salad for lunch. All you need do is add a sauce or topping such as natural yogurt, cream cheese, an oil such as olive oil, a vinegar such as balsamic or apple cider vinegar and some vegetables like peas, sweetcorn, tomatoes or olives. Soup is perfect heated up and sent to school in small flask with some bread and cheese. i.e. get a larger size then divide up the food into individual portions. This can save an astonishing amount of money and actually make lunchbox planning a whole lot easier. Cheese is a great example of how this can work. Buy a large chunk or block of cheese then chop into portions for use. Again no packaging means you can often save a huge amount of money. You can then grate in bulk for use in sandwiches on pasta salads etc. Yogurt – decant a larger pot into securely fastened smaller pots or reusable pouches. Add muesli, granola, fruit puree, honey, maple syrup, frozen fruits, fresh fruit, dried fruit or even cereals to give a different flavour and texture to natural yogurt portions. Crisps – we all hear how unhealthy crisps are but why deny something if your kids will just go crazy for them later in life. They could be allowed some crisps, within reason i.e. ready salted, baked, baked pitta chips, root vegetable crisps or perhaps tortilla’s decanted into smaller bags so they get a much smaller portion but they at least feel ‘normal’. We spend a lot on disposable food coverings such as cling film and foil. In fact if we ditch the cling film and foil we can replace it with containers with lids that can be reused. These are great for kids taking foods to school, especially as we have discussed above where they may be taking a portion of yogurt and granola to school. Remember that if you are going to use left-overs then keep them in the fridge covered by simply placing a plate over the top rather than using expensive cling film each time. Bread – although it can take a little time it is a rewarding activity which you can do with the kids. It does work out cheaper at no more than 60p per loaf to home-make bread versus up to £2.00 for a shop-bought loaf. Bread-machines or kneading machines that do some of the work for you make this task even quicker. Cakes, muffins and biscuits are not only cheaper but much better for the children in the knowledge that you and only you put the ingredients in their baked goods and you know what all the ingredients are. How often do you find baked goods in shops with labels that contain ingredients you have never heard of? Our children aren’t chemistry experiments. Fruit salad – You can pay a huge amount of money for pre-prepared fruit. I do buy these from time-to-time, generally when they are reduced, for convenience reasons. However they can be made for a lot less money. A pineapple, some banana and a few kiwi fruit can go a long way. Remember to add a little lemon juice to stop the fruit from oxidising (going brown).